A project in the radiation oncology outpatient unit at Johns Hopkins Hospital showed an improvement in clinician’s comfort level in responding to urgent patient care situations after a department-wide exercise focused on recognizing the signs when a patient’s condition was declining during their appointments. The focus in ambulatory settings was the practice of emergency and code blue situations. 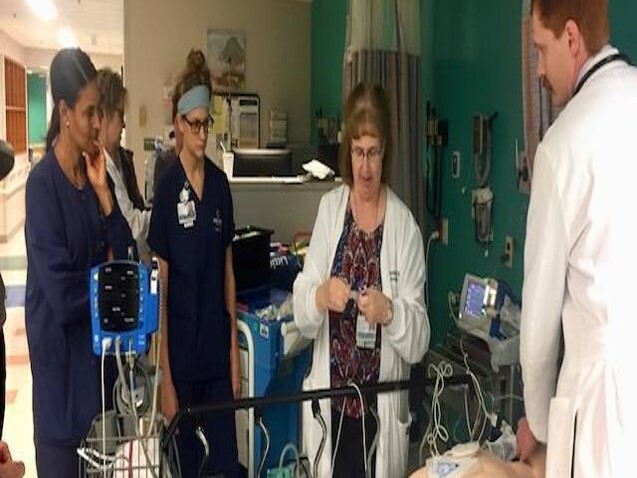 The project, led by three nurse leaders from the Johns Hopkins oncology team, educated clinicians to recognize when patients are deteriorating and how to properly respond during clinical situations. Their results were revealed at the Oncology Nursing Society 43rd Annual Congress in Washington, D.C., in May. The purpose of the quality improvement project was to improve the knowledge and comfort level of the care team in responding to urgent patient care situations in the ambulatory radiation oncology setting. Roberta Anderson, DNP, RN-BC, a nurse manager for the Department of Radiation Oncology and Molecular Radiation Sciences at the Johns Hopkins Kimmel Cancer Center, said the goal was to get staff comfortable in recognizing and responding to situations in a single visit scenario. Anderson said that by using the interdisciplinary team approach and practicing the workflow, the staff better understands who is doing what during these clinical situations. With this coordination and collaboration, she said the patient has a better chance for a positive outcome. The project has been in effect for about six months and is ongoing, but Anderson said a survey of the staff showed the education and training had a positive impact on their comfort level with the scenarios. Practicing the scenarios helped identify gaps in practice that will be used in future simulations and have already been used to improved actual clinic practices and standards. In addition to planned scenario simulations, a surprise “code bell” scenario calling for an all-hands response showed the training was working. Staff responded promptly and efficiently to the surprise scenario, developed with the assistance of the simulation center. Clinical technicians, radiation therapists, physician providers, and nurses participated in the project. In a survey done after training, staff felt significantly more comfortable in performing the steps to call the code team, managing seizures with complications, knowing the role of each code team member, and obtaining emergency supplies. The results from the project showed that while educating the staff in recognizing deteriorating patient conditions is important, team dynamics during these situations is equally important. The project found having the proper knowledge set and improved team dynamics go hand in hand. The project also identified that more work is needed to help staff anticipate and predict those patients who are at risk for declining conditions while in the outpatient area during a single visit. “Ultimately, we hope this work will culminate in an effective model that guides the care of acutely medically declining patients,” Anderson said. Rad onc project: Practicing declining patient simulations help improve clinician responses . Appl Rad Oncol.